Jigsaw Crossword - this puzzle splits the grid into a range of smaller shapes and you must fit them together, just like a jigsaw, to complete the puzzle. Anagram Variant - an interesting variant where each word of the puzzle has a clue, as normal,BUT the clue is an anagram of the solution word! Thus if the answer is 'algorithm' the clue could be 'logarithm'. Skeleton Crossword - in this puzzle, the grid is almost empty - apart from the clues. You must work out what the shape of the grid is, including all the coloured cells and enter the clue numbers to make the grid. An interesting puzzle, if a little daunting at first. To The Letter - in this variant every answer includes a certain letter at least once, for instance in a literal "X"-Word, the letter 'x' will appear in every answer. Beginning With - here every answer begins with a particular letter, or group of letters, specified. So all answers could begin with 'B' for instance. From A - Z - in this novelty variant, there is one answer that starts with the letter A, one with B and so on through to Z - an interesting puzzle. This is often displayed without giving the clues with their corresponding position on the grid, but often simply the list of clues and the solver must work out which goes where! Double Choice - here each cell is split in two, and each contains a letter, you must make a choice between the two split decisions to work out which is the correct letter to go in each cell to form a word; the other is crossed out. Collapsed Grid - in this puzzle, all the letters in each column are placed from the bottom up of the grid and you must work out where the blank cells go in each column and draw the puzzle grid correctly. This can also be displayed with the rows collapsed instead of the columns. 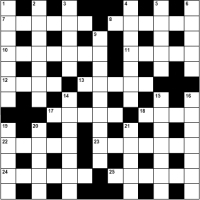 Knight Crossword - in this puzzle, a filled letter grid is given, with the first letter of each answer marked. However, rather than filling in a regular grid, the letters are distributed in the way that the knight in chess moves; therefore you need to work out how the knight moves from the first to the last letter of each clue to fill this intriguing puzzle.